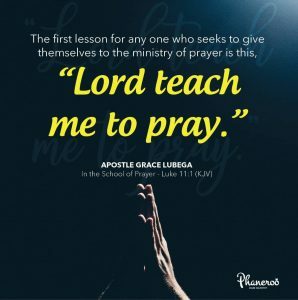 Luke 11:1 (KJV); And it came to pass, that, as he was praying in a certain place, when he ceased, one of his disciples said unto him, Lord, teach us to pray, as John also taught his disciples. Prayer should never be a self orchestrated effort to prove one’s ability; it ought to be Spirit taught. There are people who pray because they have seen other people pray; they pace and move about in prayer, not for any particular reason but because they saw other men do it. There are people who pray because they read about prayer in a book and it showed them certain formulas, like “ACTS”( Adoration, Confession, Thanksgiving and Supplication). But have you ever sought to cultivate a life of SPIRIT TAUGHT PRAYER? Prayer-less praying is Spirit-less praying. The Holy Spirit is our helper; and, He is always available to instruct and teach us the patterns of prayer. He is the Spirit of grace and supplication (Zechariah 12:10). “Lord teach me to pray” is a place of humility in the understanding that it is all about Him. “Lord teach me to pray” is the knowledge that prayer is a Grace issue and that the sufficiency is of Him and not of us. PRAYER: Father, I thank you for your Word for today. My God I am grateful for your heart towards me that is always willing to instruct me in the things of the Spirit. I thank you because you instruct and teach me to pray. More than ever before, today I humble myself as a student in your school of prayer, eagerly learning the patterns of prayer that bring results. To the glory of your name. Amen.